Up and out at 9:15am. We plan a leisurely day to see if we can re-coup from the last two busy days. Have a wonderful breakfast at "Tags on 10th." [$10].Went to the Buffalo Bill Wild West Museum.What a neat place.If you ever get to Cody,WY.don't miss this place!!! [spent $25 on souvenir's]. After Buffalo Bills we find a real nice laundrymat...we've got lots of dirty clothes.[$3]. Fill up the S-10 for $15.75 and we're on the road again. It's 4pm and we managed to have our restful day.We needed it cause we were so tired from the past two days at Yellowstone.It's almost 40 miles to Mt. Rushmore, but we are still going to take our time. At least the weather is not freezing cold with snow and rain!! We do go thru snow covered mountains on the way, but it looks real pretty and deep, on the ground. In places it is covering fences and has to be at least 4'deep.We arrive in Sheradon,WY. about 7pm.Check into the Super 8 Motel for $38.Then to Perkins for dinner. [$13].Play cards, watch TV & off to bed. Breakfast at Perkins [$11].Stop at the grocery for drinks for the cooler [$6].Then on our way; The sun is shining, looks like a pretty day. 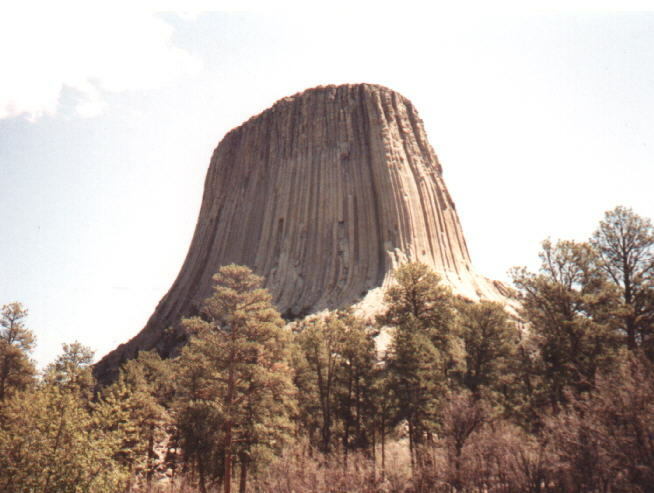 We stop to see "Devils Tower".Looks just like it did in the movie "Close Encounters"
The Devils Tower National Monument:Wyoming. A real unusual place..We can see people climbing up the straight rock wall thru our binoculars.They look like ants even at that magnification.Glad we stopped here. Gas up again [$15] and down the road we go.The odometer now reads 12635,we've traveled about 5,000 miles so far!! !We reach South Dakota about 2:30pm,and stop by a roadside picnic area and eat lunch. We arrive at Mt.Rushmore about 4:30pm.It also is very impressive and we spend $16 on souneniers to prove we've been here.Its nice but can't compete with our Stone Mountain in Atlanta,GA. Head out for the Badlands, its about 5:30pm now.We get to Rapid City at 7pm and check into the Four Seasons Motel for $27. When we reached the city limits of Rapid City Les spots a Black Hills Gold Wholesale Store,where they made the jewelery right next door.He bought me a pair of B/H/Gold earings for my birthday next week.I have wanted some for so long.We go to the Great Wall Chinese Restaurant for supper [$27]. Boy was it ever good...Simply delicious!! !I tell Les this can be my birthday today since I got my gift and a very special meal.Such a nice day again.Played cards and went to bed. Breakfast at the Golden Arches [$3],thats more like it.Head toward "The Wall" and the Bad Lands loop.The Wall is an incredible place, right out of the old west.We had 5 cent coffee and a danish. Les bought me a ring, it is so beautiful.We also bought Argentina [our daughter in law] a Christmas present. Picked up some neat cards here.A wonderful visit here and we leave $111.00 to help the local economy. The Badlands are pretty, a lot like the Painted Dessert, but with lots of grass.Stop at a cafe in Chamberlain for lunch [$12]. Gas up in Kimball [$18.50] Odometer reads 13026, we've broke 5,000 miles now.Check into the Motel 6 in Sioux City, Iowa for the night [$30]. Eat supper at a family restaurant for $10, and off to bed. Headed out at 8:15am.Thought we would never find a place for breakfast or gas.Finally at 10:40am.we stopped at a place in Missouri for gas [$18.35],and some food [$10.50].Called the hen house. The odometer reads 13398.Stop again in Clinton,MO. for a break.Enjoy a McDonalds Yogurt $1.50.Hit a Wallmart for some film & etc.$14.50.Gas up again in Springfield $11.50 . We finally arrive in Branson,MO. about 6:30pm and check into "Mr. Tuckers"Motel for 5 nights [$192.00].Dinner at the Western Sizzlin $14. We make plans for the Shows and other activities during our stay. Ate a nice breakfast at the Old Apple Inn $12.Then off to get tickete for the shows.We bought Mel Tillis book and a Mo. spoon for $14.Also tickets to his show tonight [$27].We're going to see Conway Twitty at the Roy Clark Theater tomorrow night [$58 for the dinner show].We'll see Boxcar Willie saturday afternoon for $20.We also make reservations to see The Shepard of the Hills, Sunday night. Les made some video of the Branson "Strip". Went to the Mickey Gilley Theater and got tickets to see Tom T. Hall Sat. night for $29.00. Visited the Outlet Mall and some gift shops and drop another $33, you can really spend money around here!!! Back to our room for cheese and crackers.Also look at some of the video we've taken so far.Go to Dinner at Uncle Joes's BBQ $11.All the eating places around here are very Country in atmosphere.Lots of antiques in them.It reminds me of when I was very little. 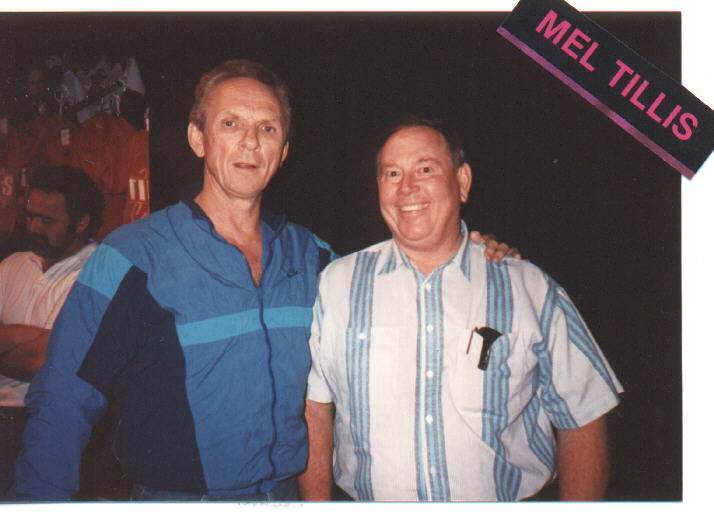 Leave around 7pm to go see Mel Tillis..What a good show it was, ran almost 2 hours.Billie Jo Spears and Mels son sang also.Mel autographed our book...What a nice day! Started the day with breakfast at Sadies Sideboard $13. What a neat place to eat! Went antiquing downtown and spent $10.Shopped at a Wood store, another $30.Lunch at Pizza Hut [$6].Then back to the Motel to rest before our big night out to see Conway Twiddy. Had a delicious Prime Rib, baked tater, green beans, blueberry muffin and all the tea and coffeewe could drink.Chocolate Mint cake for dessert.A dynamite show and we rack up another wonderful day.Can't wait for tomorrow!!! Breakfast at Adams BBQ [$6].Its raining and storming today.We look in some shops, then back to our room.We seem to need more and more rest, having fun is hard work. Went to see the Box Car Willie Show, it was great.Box Car has the same identical guitar that Les has, a Gibson J45 Deluxe. 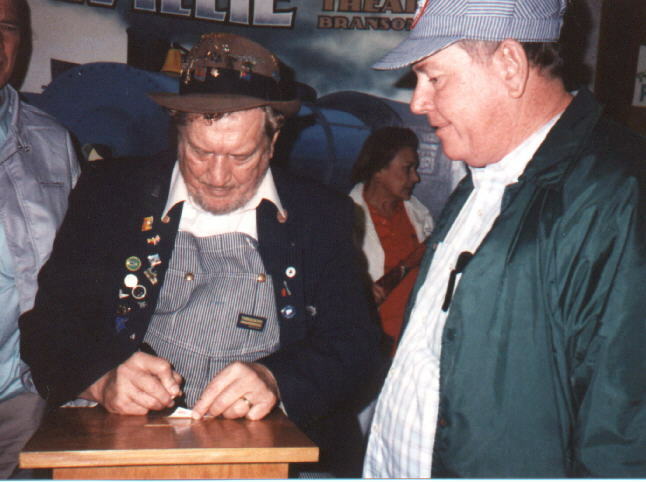 I took Les's picture with him, and he autographed a railroad hat we bought for $18.He also autographed a card for Les to put inside his guitar.So far he has Willie Nelson,Bill Monroe,Pete Seeger and Box Car Willie inside his guitar.A really great show!! We eat a buffet dinner at the Plantation House $20.Also visit Box Car's Museum for $4.Gonna rest up now for tonight. Buck Trent (Banjo player), opened for Tom T. Hall...What a treat...he was sooo good! !Also the girl singer was great.Of course Tom T's show was wonderful.We meet another couple from Florida, who are taking just about the same vacation that we are. You never know who you will meet.There are so many nice people in this world. We love to eat...we go to another neat place for breakfast, called Outback. It has so much Australian atmosphere, menus and all.I have the pancakes and Les has eggs,onion,cheese,etc. casserole, with potatoes.$13.Then we check out some shops we missed before. We ride the "DUCKS" [$18].Ducks are amphibous vehicles, used by the army in world war 2.They took us on a tour of Table Rock Lake and Dam.A real unusual experience.They drove right into the lake and drove around on the water for awhile. Back to the room again to rest up for the next adventure.We go to the movie to see "Back to the Future 3"$15, then to dinner at the Bayou Cajun Restaurant $16, real good Cajon food.Its raining now so we head for the dryness of our Motel.We pack up some of our things, watch some TV and play some cards.We're going to leave in the morning, so we hit the rack. Get an early start and head out at 6:30am. Stop in Harrison, Arkansas for breakfast at the Ranch House.$8.Its very foggy today.Stop again in Conway,AK. for gas $13. Odometer now reads 13949. Time for a Wallmart break [$11].Decide to stop in Memphis,TN. 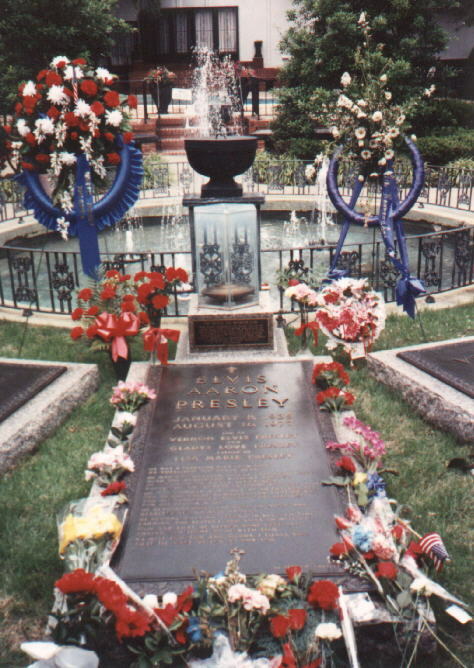 and see if we can find Elvis.Tour Elvis's home at Graceland, find out Elvis is secure in his gravesite in the yard..
We only spend $16 bucks on Elvis, but they had a lot more to take your money. If you want proof that Elvis is still alive...Click Here. Take off again and gas up in Jasper,Alabama. [$17]..Odometer 14324.Drive to Birmingham,AL. for supper at the Red Lobster $25.It was really good, but I'm so tired I go into the mens room by mistake, and luckly make it out without running into anyone else.Didn't realize the mistake till I got back to the table and Les told me.Too tired to care....Spend the night at Econo Lodge [$30].This was a really long day...we missed lunch too!! Breakfast in the Motel $6.We decide to travel all the way to Dianne's Moms in Covington,GA. today.We're about vacationed out.When we hit Atlanta we stop in Grant Park to see the Cyclorama [$7].They have changed the way you see it, instead of walking around at your own pace...You sit in seats and they turn while the guide narrates.I guess its better..More efficient anyways.Its a great place. The battle of Atlanta is played out and you can see the horrors that the yankee general Sherman committed on the South.We spend $38 in the Book Store there. Stop at the Cracker Barrel for lunch...Yum Yum.$15. Grt to Mama's about 3:30pm.Ann and the kids come over.Its good to see familiar faces again.We show some of our video's and hit the hay. Wash clothes etc.Everybody comes over for supper...we show more video's, the trip and the wedding. 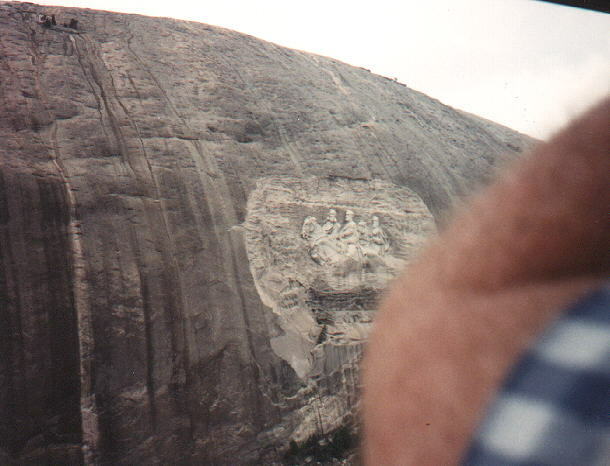 Visit relatives, go to Wallmart $25.Go to Stone Mountain..Ride the train and the skylift to the top of the mountain. See the Laser show...really good.$9.The grand finale of the show is spell-binding..They make the figures on the Mtn. come alive, and Robert E.Lee, Jefferson Davis and Stonewall Jackson ride off to the sounds of Elvis singing Dixie.It doesn't get any better than that and I get it on video tape..Yeeehawwww!! Finish off the day at El Chico's for supper...great Mexican food..Yum.$20. Buy more gas [$10.85]..Odometer reads 14600. Dianne's birthday today..She goes to the Depot for lunch with one of her friends.Hasn't seen her in 3 years, and they have fun.Everyone comes over for supper again.we have soup. Go out to breakfast at the Waffle House $8.Then to the flea market at Porterdale, by the river.They have the flea market in an old textile mill that Dianne's Mom used to work in.The old wooden floors are neat.Next we visit the Starrsville Cemetary where some of dianne's ancestors are buried.Visit at her brothers housefor awhile, then come back and fix burgers for supper..Everyone comes over. 7am hit the road for home.We're ready to be back.Breakfast at the Cracker Barrel in Macon,GA.$12.Its a nice day, sunny and partly cloudy.Get gas in Jacksonville,Fl. [$20]. Odometer=15042. Stop in Daytona at the flea market...they have a big one there.$15.Eat at Dennys for lunch $10...we're almost home.We had a wonderful vacation but we are ready to be home for awhile!! !Arrive home at West Palm Beach,FL. at 7pm.This vacation is offically over.We traveled over 7,650 miles.